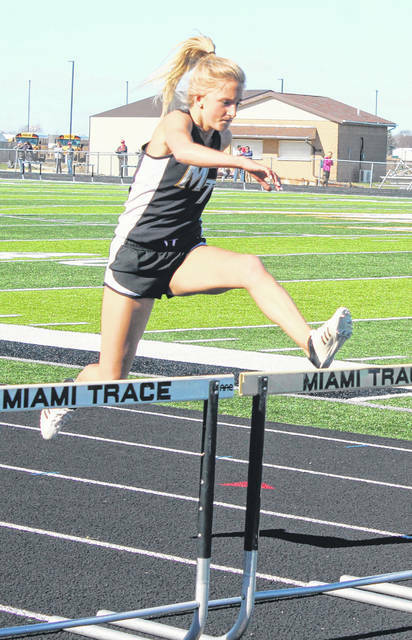 Miami Trace’s Macy Creamer clears a hurdle on her way to winning the 100-meter event during a tri-meet at Miami Trace High School Tuesday, April 9, 2019. The Miami Trace Panthers held their first home track meet of the 2019 season Tuesday, April 9. Hillsboro and East Clinton competed in the tri-meet. Miami Trace won the girls’ meet with 84 points to 71 for Hillsboro. East Clinton scored eight points. In the boys’ meet, Hillsboro got by Miami Trace, 78 to 74. East Clinton tallied 23 points. Miami Trace won seven of the 17 events. Wyatt Cory won the 110-meter hurdles in a time of 15.49. Cory also captured the pole vault with a clearance of 13’ 0”. Jake Atwood won the 100-meter dash in 11.69. Jotham Lewis was first in the 400-meter dash with a time of 55.74. Jaden Rowe won the 800-meter run in 2:25.80. The Panthers won two relays. Atwood, Jaden Haldeman, Keegan Terry and Matthew Haddox won the 4 x 200-meter relay in 1:37.49. Terry, Jayden LeBeau, Josh Liff and Atwood won the 4 x 100-meter relay in 47.10. On the girls’ side, Miami Trace won six events. Macy Creamer won the 100-meter hurdles in 17.22. Creamer also won the 200-meter dash in a time of 27.40. Creamer anchored the winning 4 x 100-meter relay. The quartet of Lilly Litteral, Isabella Vanover, Tori Morrison and Creamer won with a time of 53.25. Isabella Vanover won the 100-meter dash in a time of 13.30. Mallory Conkin won the 1600-meter run in 6:04.19. She also won the 3200-meter run in 13:44.40. Miami Trace’s next meet is Tuesday, April 16 at home against Adena beginning at 4:30 p.m.